Held on June 30th each year, Asteroid Day draws attention to the risk of collisions from celestial bodies on the Earth. The day marks the anniversary of the Tunguska explosion in Russia that occurred on June 30, 1908 due to an incoming meteroid. Within Japan, the Japan Spaceguard Association and member of JAXA are also involved in Asteroid Day. In particular, the two asteroids explored by the Hayabusa and Hayabusa2 missions, Itokawa and Ryugu, both have orbits that approach the Earth, and data from these missions is also being used to better understand planetary defense. 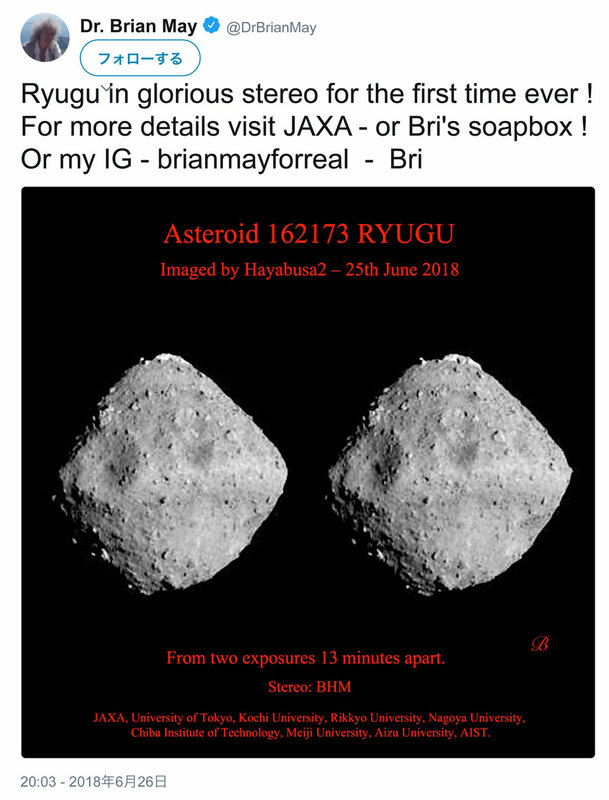 Brian May has previously created images to sterescopically view celestial bodies, and approached the Hayabusa2 Project to propose a stereoscopic image of Ryugu. May corresponded with Dr Patrick Michel from the Côte d'Azur Observatory, France and member of the Hayabusa2 Project (the two scientists are seen in Figure 1). According to Michel, Brain May was very pleased when he received the images of asteroid Ryugu from the Hayabusa2 team as the stereo image could then be created very quickly. Figure 1: Brian May (left) and Patrick Michel. With these images, Brian May created the stereoscopic image pair of Ryugu, revealing the asteroid in three dimensions for the first time (Figure 2). If you can manage the stereoscopic vision, you can see not only the whole form of Ryugu but also the irregularities of the surface. Figure 2: Stereoscopic images of asteroid Ryugu created by Brian May from images taken with the ONC-T, posted on Brian May's twitter account. If it is hard to see in stereoscopic vision from Figure 2, how about Figure 3 below? This figure was created by Yoshiro Yamada, who superimposed the two images made by Brian May in red and blue. Using red-blue stereo glasses (right eye should be blue, the left should be red) the image should then appear in three-dimensions. Figure 3: Image to be used with red/blue stereo glasses. We also have a video from Brian May (Figure 4), demonstrating how to view asteriod Ryugu in three dimensions. We think that being able to see Ryugu in three dimensions makes the asteroid appear even more interesting. At the Hayabusa2 Project, we are about to conduct a variety of different analyses of Ryugu, including creating a three-dimensional model of the asteroid in the near future. Acknowledgement: Dr Brian May agreed with the publication of pictures, images, and videos shown in this post. 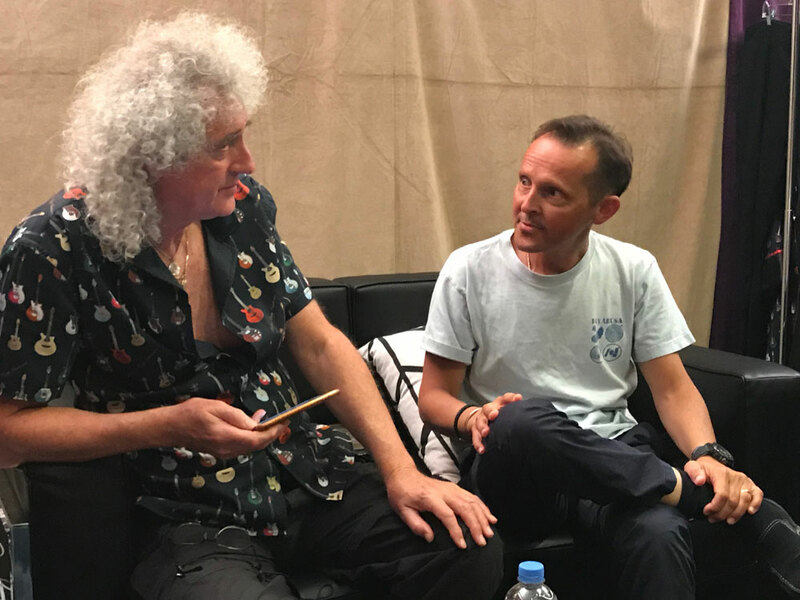 In addition, Dr Patrick Michel contacted and exchanged data with Brian May. The Hayabusa2 Project thanks both of you.